Welcome to the home of the Kiwanis Music Festival of Guelph. ALL PROGRAMS HAVE BEEN COMPLETED and are now available for download from the Programs page. All Programs will be available in print at each Festival Venue. The Schedule Overview is still available on the Programs page and everyone is welcome to attend any of the Festival classes for only $2 per session. Festival Passes can also be purchased at any venue for $12 and allow the bearer admittance to all sessions throughout the Festival. 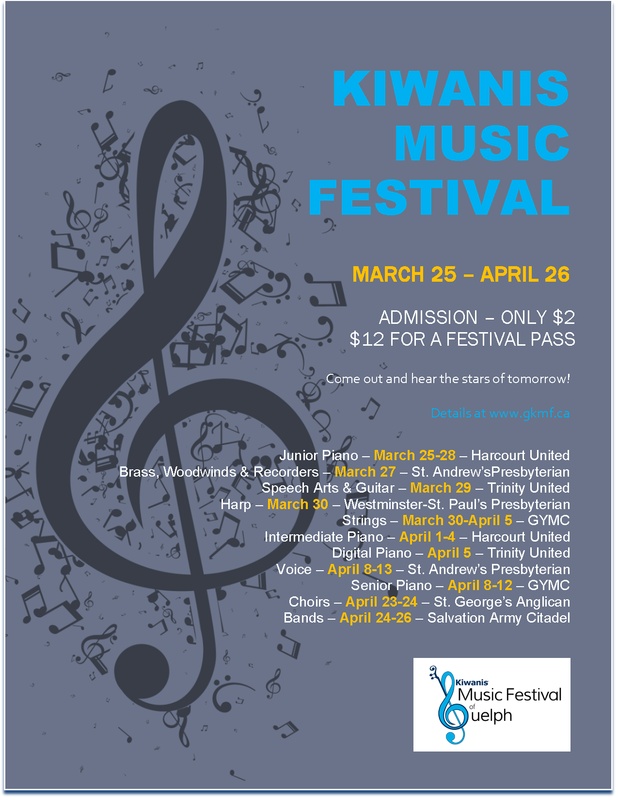 The Kiwanis Music Festival of Guelph provides thousands of young, aspiring musicians with annual performance opportunities second to none. We are the largest youth services program in the arts in our community and your support is vital to our existence.